For 2017, the City of Grand Rapids planned three Commission meetings to be held out in the community rather than the usual commission chambers housed on the ninth floor of city hall. Tuesday marked the second of these neighborhood hosted meetings and was held at the Salvation Army's Kroc Center. Dubbed the "Commission Night Out," the idea is to bring City Hall to the people. And to give those who can’t regularly attend these meetings an opportunity to listen and engage with the city regarding issues of concern they may have in their community. It also allowed the city to set up booths distributing information on committee openings, the upcoming budget, government job opportunities, city department information, the new 311 initiative etc. And while the venue and presentation of Tuesday’s meeting had changed, it was clear that the concerns of those in the community who attended still have not. 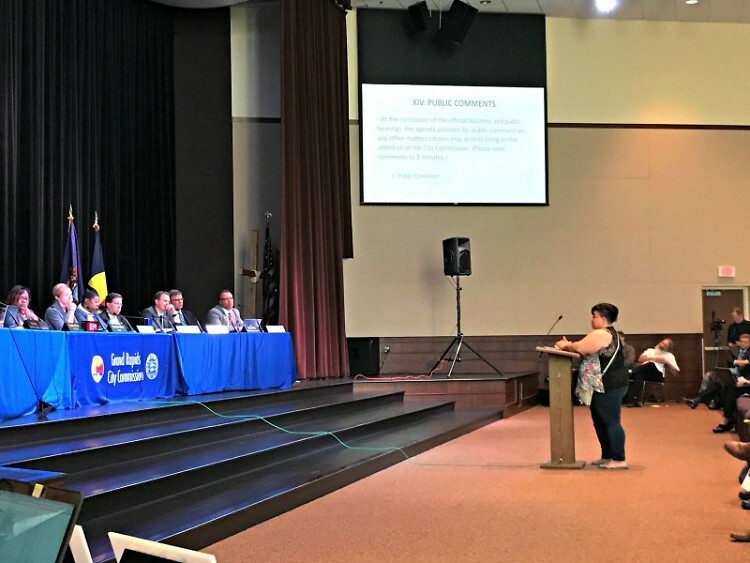 The ongoing housing crisis, the disparity of socio-economic prosperity effecting communities of color, and issues regarding the GRPD and its relations with the community have been recurring themes of concern brought by citizens attending commission meetings for months now. And Tuesday night was no different. During the public comment period multiple citizens spoke about the rising costs of housing in the city. They described the need for the city to do more, on enforcing current regulations and acting to help families that are being directly affected by this crisis. Others discussed how current problems have led to an increase in homelessness even among working families. One of the more moving exchanges came from a mother, Alicia Reece. She described to the commission how she and her family have been forced into homelessness. “I work two jobs and I have a third job now, looking for a house for my family.” Reece went on to tell the commission her monthly gross income, including child support, is $2700. However landlords have informed her that they do not consider child support a form of income, and have denied her rental application asking instead that she work more hours to make up the difference. “There are brand new houses, brand new apartments sitting empty,” Reece said. “And I drive around looking for rent signs because I have a family. And I have to tell my kids that I don’t work enough” to qualify? I’m working 16 hours, back to back, just to show these landlords I can afford three times the rent” on a $900 a month three-bedroom apartment." Following Reece’s comments another citizen, Lyonel LaGrone, spoke to the commission asking for the city to enact a “robust civil rights ordinance” to protect citizens against practices like what Reece and her family have experienced. Towards the end of the evening public comments shifted to one of the main agenda items of the Commission Meeting, the City’s preliminary fiscal plan for 2018. Specifically the Commission’s recent consideration of adding an earmark of $5 million over 5 years for “Community Police Relations” to this plan. Some citizens commended the Commissioners for creating a general fund to dedicate towards this ongoing. However more were skeptical of earmarking the funds without clearly stating their exact use or having a clear understanding of what the community wants and needs regarding engagement. The Mayor responded by clarifying that the city had not decided on how to specifically use the funds. They are waiting until they have more community input regarding their best use. The City Commission will be voting on whether to adopt the preliminary fiscal plan as the official 2018 Budget next Tuesday, June 13th. Also there are a series of five community meetings coming up next week regarding Community Police relations in Grand Rapids. The City is looking for feedback, suggestions and ideas on how to improve this issue. Here are the meeting dates, times, and locations. City Commission meetings are held twice a month on Tuesday evenings at 7 p.m.
Commission Meeting Schedules and agenda packets can be found here. Committee of the Whole meetings are held Tuesdays at 9:30 am. Committee of the Whole Meeting Schedules and agenda packets can be found here. Recordings of all Commission and Committee of the Whole Meetings can be found here.